Amidst the green Cordillera ridges, Proudly lies our chosen homeland. The land of the brave and the noble, A precious heritage from the past. Onward and be blessed beloved homeland, We are proud to be called cervantenians, The land of happiness and prosperity, Where unity exist amidst diversity. Let's all sing our love and praises To our homeland cervantes. 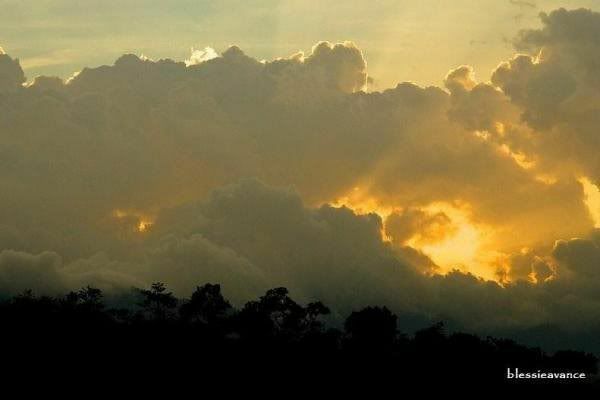 The land where peace,love and harmony reign, The place where every man dreams to dwell. Let's all sing our love and praises To our homeland cervantes, Where freedom,justice and equality reign, The place where every man dreams to live. Go forth....cervantes.... Bring your people to a brighter tomorrow, Thou shall be the light and inspiration, Of every homeland,across the nation. When Junifer Pecha, 25, got his call from DepEd to become a teacher, he knew it, he will go to one of the remotest area of Cervantes District. His first assignment, Dinwede Elementary School. Agtultuloy ti panangisaysayangkat ti DZTP Radio Tirad Pass iti panangtulong kadagiti kakailian nangruna dagiti adda iti ginggenget iti banbantay iti ILocos Sur a narigat a matulongan ti gobierno. The earliest known historical document about Cervantes was that it started as a small Igorot village known as “Mantamang” an Igorot word meaning “to look over”. Man and horse trails connecting the lowland and upland neighboring localities were frequently used by Igorot traders and Chinese merchants who always had to pass the village. In the year 1879, March 4, the residents of Mantamang petitioned that the village be recognized as a Christian town under Lepanto-Amburayan, a sub-province of Mt. Province. The town was given the name “Cervantes” which remains the name of the town at present. How it got the name Cervantes is not known or documented. Maximo Lilio de Garcia has written that Cervantes was formerly a barrio when it was founded by the Spanish colonizers. It started with only thirty houses made of light building materials like bamboo and cogon. In spite of the fertile lands that abound the place the native used to cultivate only small patches of ricefields which made the barrio unprogressive. Lilio has further stated that Cervantes has a distance of 24 kilometers from Lepanto. The system of communication was maintained weekly due to its poor road that traversed the mountains zigzagging upward the hillock of Cayus where a storage house was located and down to the lowlands reaching the Malaya River which sometimes overflowed during the rainy season making the trail slippery. During the Spanish era, a portion of the land near the Abra River bank was used as a penal colony by Spanish soldiers who brought with them the Ilocanos from the lowlands. In the year 1883, a Malaria epidemic affected the colony prompting the Spanish officials to move to the upland which is now the present location of the town proper. Five thousand grams of quinine ended the epidemic. At the time the barrio was founded the inhabitants were distributed among the three principal rancherias. The first settlement was established on an elevated healthful well-ventilated place, where a school house for children of the neighboring barrios, a storage building for tobacco and barracks were constructed. Springs were the source of a potable, clean and abundant water supply. The natives cultivated and produced vegetables and fruits suitable to the climate. Coffee was produced on the land annexed to the Comandoncia. The next group of settlers founded a rancheria less than half kilometer distance from the first settlement. This time, better types of houses were built, with an estimated population of 819 residents migrating from the other rancherias and barrios of Mailec, Cambaguio and Magueymey. Then another small community was developed on both sections of Cervantes widened trail where a spacious administrative building, other ruinous edifices and barracks built of road for the civil guards were located. Gradually, the original settlers of the area, the Igorots were displaced and forced to move to the hills and mountains. This explains why at present Igorots are mostly settled in far-flung barrios while the Ilocanos and those who intermarried with Chinese, Spaniards, Americans and other foreigners populate the central area of the municipality. The constantly growing trade of the mountain country made it necessary that it should have a good outlet to the coast. A road was constructed from Cervantes directly west over the Malaya range, traversing the sub-province of Amburayan from the west and coming out of the Municipality of Tagudin. This road was later improved and widened and beame passable all the way through Bontoc. During the American colonial rule, Act No. 410 of the Philippine Commission, Section I, states that territory hitherto comprised in the Commandancia of Lepanto, Bontoc, and Amburayan together with the territory lying between the boundaries of Abra, Cagayan and Bontoc and not hitherto included within the limits of any province organized under the Provincial Government Act, is hereby constituted a province, which shall be known as the Province of Lepanto-Bontoc. The province was divided into three sub-provinces. The sub-province of Lepanto, which shall comprise the territory hitherto included in the Comandancia of Lepanto, the sub-provincce of Bontoc which shall comprise the territory hitherto included in the Commandancia of Bontoc and that limited by the boundaries of Abra, Cagayan and Bontoc and not hitherto included within the boundaries of any province organized under the Provincial Government Act, the sub-province of Amburayan, which shall comprise the territory hitherto included in the Comandancia of Amburayan. Cervantes became a pueblo by virtue of Act. No. 411 of the Philippine Commission which is an act providing for the establishment of local civil government in the townships and settlements of the Province of Lepanto-Bontoc. Its first municipal president was Benito Aguirre and the vice president was Mariano Gaerlan. In 1899 when the Americans captured Cervantes after the fall of Tirad Pass, they made it a capital of a military province with William Dinwiddie as the first Military Governor. Later Cervantes became the seat of government of the Lepanto-Amburayan sub-province of the Mountain Province. On May 15, 1907, the Philippine Commission passed Act. No. 1646 which provided for the transfer of all sub-provinces of Amburayan and large sections of Lepanto and Benguet to Ilocos Sur and La Union. 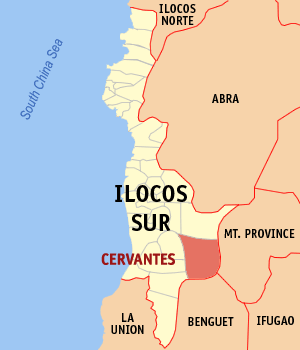 By year 1922, Cervantes became a regular Municipality in the Province of Ilocos Sur. During the Philippine-American War, Cervantes was one of the municipalities where General Gregorio del Pilar and his forces fought the Americans in the famous battle of Tirad Pass in December 1899. In June 1945, the US-FIP NL, spearheaded by the 121st Infantry, defeated the enemy at Bessang Pass in Cervantes. This event hastened the surrender of General Tomoyuki Yamashita. It was at Bessang Pass that the Japanese made a last stand in their operations in the North against a band of Filipino guerillas.